I officially have the flu. But what flu I don’t know and probably won’t. It sees that as of Monday the state of WV is overwhelmed with tests for the H1N1 virus. While a “rapid result” test is available for the regular flu strain, the H1N1, or “swine flu”, takes a minimum of 3 days to do and get results. Since the treatment for both strains are the same, WV, as I understand it, will not test anymore cases and just treat them all the same way. My treatment is 5 days of Tamiflu and some cough syrup from the pharmacy. And to plan on being down at least another week, perhaps more. The first dose of Tamiflu is in me now. I’m waiting for the cough syrup to be filled now, probably another 2 hours. l has my neuropathy all fired up. And that is pretty miserable, too. I’ve been under the weather since Tuesday afternoon, coughing, aching, sneezing, freezing and burning up, among other things. I now sit in my family doctor’s office, adorned with a “fashinable” yellow face mask. I am guessing there is a reason for the fashion accessory I’m wearing. But I hope it isn’t the reason I think it is: H1N1. I am under or about 24 hours from the onset of symptoms and have hear there is a simple and fast swab test that can identify it if that is the problem. I dearly hope there is and that it is negative. I’ll post more when I know more. This we sent to me by my cousin after reading the article from Monday (http://tinyurl.com/l6eapj). I thought it was a beautiful and powerful testimony and wanted to share it with you. (My friend) Beth died of stomach cancer also. She was a believer, a grace-filled, loving child of God, taken home too early from my own selfish viewpoint. We gave birth to our boys at the same time, met in Sunday School, taught our boys to swim in my pool Those boys were only 12 when Beth died. They are both married today, young men, about to begin families someday. Beth was married to a man from a large Catholic family. Her husband joined and was a member of the Baptist church with Beth. One of the family traditions, was a huge family reunion each summer. The summer Beth was taken ill, she struggled to get ready for that reunion. She weighed less than 100 lbs, she had lost her hair, and had very little energy. I went to visit her, to help her iron and pack her clothes for the trip. She really didn’t feel like going she told me. BUT, she felt she had something that needed to be said, maybe one of the most important messages she might still have to be shared. So she went. They taped her message. I still have it. It was played at her funeral…it was a story about trust. Trusting your life to Christ. Trusting in the scriptures that tell us, that in Christ and Christ alone, we live on. We do not leave our loved ones, we are reunited again in our heavenly home. However, not all of us will be there and that pained her. She wanted them to not grieve for her, but to know that she only wanted to honor God in her death. She left them with a plea. Please seek Him, and trust him. Accept him so they could be together again one day. I know after Beth died (July 31st, 1997) that at least two of those family members accept the Lord. One being her father-in-law who died only a year or so after Beth. What a gift she gave them all. I miss her. But I know that I will get to see her some day in Heaven, and that I am assured of! Today I received a question via email in response to my article about A Good Day. It was a question about Scripture, one that I was able to answer with little difficulty. In fact, it took me very little time to write my response. I pray that it helps the recipient better understand the passage in question. Anyway, after the fact I began to think what an honor it is to have someone ask for help understanding God’s Word better. After all, I’m nothing special, not a scholar or a pastor, just a servant of the King with a desire to know Him and His Word better. And a desire to help relay His Truth when I can to others. This then led me to feel so humbled by the idea of actually being able to do just that with God’s help and the leading of the Holy Spirit. It amazes me that God sees fit to use me any way, let alone to help someone understand His Word or to teach. I know it shouldn’t amaze me; God is all powerful and can do anything He sees fit to. I guess what amazes me is that for whatever reason He has chosen to use me anything. If He can take me and sharpen me into a tool worthy of His use, He can do the same with you, perhaps in a different capacity but none the less He can. Are you willing to allow Him to sharpen and shape and mold you for His purpose? I can testify that if you will the reward He gives is unparalleled. Today I was blessed to be able to attend two wonderful church services, hearing a great Sunday school lesson, two rousing sermons, and the inspiring songs of praise that go along with the services. Between services, I was privileged to spend several hours with my grandson (and we got to take him to church, too!) just enjoying him. Yes, today was indeed a good day for me. But that was not the case at all on September 20, 1977. See the rest published at Relijournal: http://tinyurl.com/l6eapj. The last two days I have been working on cleaning the old caulk out of the shower and getting new installed. The old stuff was 100% silicon and a real pain to get out. Add in the fact that the shower isn’t exactly plumb and level, giving some joints very large gaps, and it made for quite the job, at least for me. It wasn’t glamorous work either, wallowing around in the old stuff, on the floor, sweating like a pig. And my wife would’ve done it. Considering my limited mobility and physical disability, there isn’t a lot of things I really can do. But this was one thing I felt like I could so I did. This all makes me think of the universal church. There’s a lot of work to be done out in the field, so to speak. And much of that work isn’t glamorous but messy, hard, time consuming labor. How much greater an impact on the world could we have for Jesus if we were all a bit more willing to do more of the dirty work? I think the answer is a substantial impact! As you no doubt know by now, 24-year old Yale grad student Annie Le was murdered last week in a Yale campus lab building. Today’s e-devotion was based on this event. I have expounded on the subject in an article that was published today on the Web. It contains a concise time line of events and facts. But more importantly I speak about the lesson we should learn from her death. 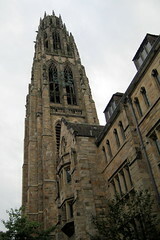 You can read the article here: Tragedy at Yale.